A few years ago, when I was "low in work" at the particular customer, I created a little tool set on XML processing. 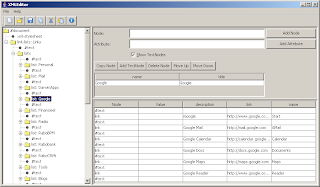 I called it Darwin XML Editor and XML Tester. The latter name I now find not so well choosen. So I would now call it XML Tools. The purpose of the tool set was to figure out how to process XML in java. I already had a private xml based solution to gather my frequently used browser links into an xml file and convert it using an attached xslt stylesheet to an html page. This html page provided the links in poplists and using java script it could load the link. It would be nice to have a hierarchical editor that showed my xml in an explorer and let me edit particular attributes in a table format. It turned out handy for me. But the most I had a toolkit that allowed me to easily load XML as a text file and parse it, perform xpath queries and just traverse through nodes, etc. In several projects I used it to read xml-based config files. Many of those cases I probably could have done using Apache-commons. But it is handy to have your own toolkit. Especially in cases when you have repetitive lists of entities with properties. My project originally was written using the Oracle XMLParser. Handy, because I use JDeveloper and that comes with the parser. For some time now I had plans to look if I could make it vendor independent. I will provide here some highlights of the changes. http://www.ibm.com/developerworks/library/x-javaxpathapi.html for xpath processing. .
* Create a new DocumentBuilder. Mark that this code is part of a XMLFile class that extends a TextFile class that gives me the methods to load the file into a String attribute (text). Here I extracted the conversion from the text attribute to an InputSource object in a separate method. 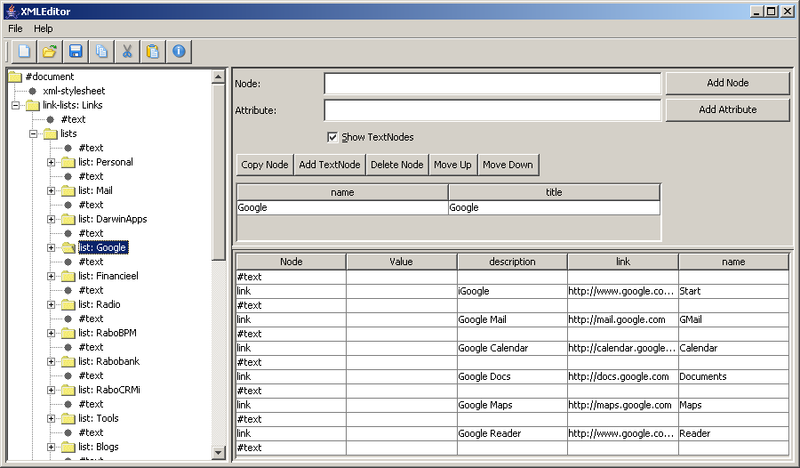 Also the creation of the parser (the DocumentBuilder) I put in a seperate method. This because I also need it to be able to create an empty Document. * Namespace Resolver: Helper class to do namespace aware XPath queries. The vendor indepent way is a little more complex. But it gives you some more flexibility. * @param returnType the return type that is expected. The differences are in the fact that you first have to 'compile' an xpath expression. And that the evaluation of the XPath on a Document expects you to provide the expected result datatype. (see the comments of the evaluate method). Then it will result an Object that you have to cast to the particular Java Class that corresponds with the Result XML DataType. * XmlTransformer: Class implementing functionality to Transform XML using XSLT. The code is not much different. Most important is that you have to wrap the input, xslt and result objects into particular interface objects. The examples I found worked with File(s) as Source and Result objects. But I wanted Document objects for the XLST and Input objects. And I want to have the result into a String, to be able to process it in anyway I want. I added also the possiblity to pass XSLT parameters. But I got it from a project I worked on and see that I haven't put that in the class in my XmlFiles project. I hope this helps in understanding how to work with XML parsers. Ofcourse all is rudimentary (I have several large books on the subject in the cupboard). But I have pretty much enough with the above. The code in my XmlFiles project is basically around this code. On top of these methods I have several other helper methods to do traverse nodes or to get it in a particular way. I thought it might be helpfull to put the Oracle Native methods side by side with the vendor-independent (JAXP) code. Doing so I would not state that one way is better than the other. The vendor-independent code have clearly the advantage that you can simply replace the parser, just by changing the class path. The code will work with the Oracle XML Parser just as good as with the Apache Xerces-J parser. The reason I did it the Oracle way before was just because I ran into these examples first, the time I started this. Probably there still are good reasons to use the native API's. Oracle also has a Pl/Sql Wrapper around the XML Parser. So the Oracle XML Parsing code has a Pl/Sql counter part. Might be nice to do this in a Pl/Sql way sometime. But as the code above isn't rocket science, it isn't new also. XML Parsing in Pl/Sql can be done from Oracle 8i onwards. Also roughly ten years already. Hmmm... That's interesting. Where did you first hear about this? Do you have other blog posts I can take a look at? Thanks. You could look into my earlier blogs on XML, see tags.